Moving to end the social media chatter that the Duterte administration’s second tax reform package will result in the re-imposition of the value added tax (VAT) and import duties on books, the Department of Finance (DOF) issued a statement on September 25 clarifying the matter hopefully once and for all. “The DOF has assured the public that the purchase and importation of books will remain tax exempt under the second tax reform package of the Duterte administration,” the department’s statement said in what is perhaps its clearest and most definite clarification of the controversial matter. It quoted DOF Undersecretary Karl Kendrick Chua saying that “the value-added tax (VAT) exemption of books will remain as provided under the National Internal Revenue Code along with its importation as stated under the Customs Modernization and Tariff Act (CMTA)." 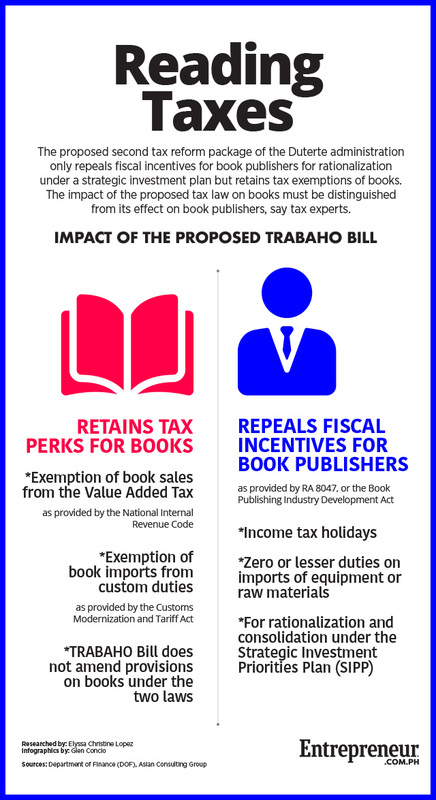 In recent weeks, a social media post that went viral complained that the government’s second tax reform package, now called Tax Reform for Attracting Better and High-quality Opportunities (TRABAHO) bill, would increase taxes on books. The post claimed that the bill may result in the lifting of exemption of books from taxes and customs duties as it included Republic Act 8047, or the Book Publishing Industry Development Act, among the incentives-granting laws whose tax provisions will be repealed. Many feared that the repeal of tax provisions under RA 8047, which grants fiscal incentives to book publishing, would result in the reimposition of VAT and customs duties on the sale and importation of books. Related story: Will TRAIN 2 Mean More Expensive Books? The TRABAHO bill aims to lower corporate income taxes gradually from 30 percent to 22 percent in the next decade or so, as well as curb generous fiscal incentives to selected companies and industries. The proposed law was recently approved by the House of Representatives but is still pending in the Senate. The DOF official, who is in charge of coordinating the administration’s various tax reform proposals, also clarified that the Philippines remains faithful to the provisions under the Florence Agreement, a 1952 treaty sponsored by the United Nations Educational, Scientific and Cultural Organization (UNESCO), which calls on all UN member-states to abolish taxes on the importation of certain educational, scientific and cultural materials, including books. The country signed the agreement in 1979. Chua clarified that the TRABAHO bill only seeks to repeal the fiscal incentives of the enterprises engaged in book publishing since the government is hoping to streamline the incentives given to certain industries in a single investment plan. “And in my view, this [publishing] is among the sectors that has a great chance of being included in the SIPP (strategic investment priorities plan),” Chua said. Similar to the Board of Investments’ current Investment Priorities Plan (IPP), which is reviewed every three years, the SIPP will list businesses favored by the government to bring substantial economic growth that would enjoy fiscal and non-fiscal perks, including tax holidays and exemption from import duties. Currently, the 2017 IPP includes publishing as one of the businesses that benefits from incentives. Tax expert Raymond Abrea, a leading certified public accountant and founding president of the Asian Consulting Group, explained that the TRABAHO bill repeals fiscal incentives to book publishers so these could be consolidated under the SIPP but does not remove the tax and customs duty exemption on books. “The VAT and duty exemption of books are distinct from the fiscal incentives enjoyed by the book publishers,” he said. Early this month, the House of Representatives approved the TRABAHO bill on third and final reading. One of the bill’s main features is to lower the corporate income tax (CIT) from the current 30 percent to 20 percent in the next 11 years. The rate will be decreased every two years by two percentage points starting in 2021.